Good bedroom lighting design is essential for creating an inviting and attractive bedroom design. Once you have figured out what type of bedroom lighting scheme best suits your bedroom, start thinking about the best designs to suit the room's style and decor. In this design guide, we take your through a range of versatile, contemporary lighting options, from cosy to edgy. A wall light is must in any bedtime reader's bedroom; an extendable wall light makes adjusting the light to your needs even easier – and adds a contemporary, slightly industrial look. We love the warm copper sheen of the Aberdeen Wall Lamp by It's About Romi. Fairy lights or garland lights are the easiest (and probably cheapest) way to cheer up a bedroom. With tons of option available, you can choose the exact shape, length, and colour you prefer. Our pick are the very romantic Juliet White Rose Fairy Lights by Lights4fun. With their delicate rose shape, they are perfect for creating a relaxed, slightly bohemian look. You don't have to live in a country cottage to enjoy a rustic bedroom style. Whitewashed walls and upcycled furniture are a must. But the right lighting is also essential to getting the look right. Choose a bedside lamp with a retro lantern design to complete the scheme. The dainty Horse Copper Lantern from Dunelm will add a country-cottage charm to any bedroom. A brightly coloured bedside lamp will instantly cheer up a neutral bedroom. And why have one, when you can have several in different places? Have one on your dressing table, and one on your desk! Our pick is the pretty mini Gaston range from Loaf. Symmetrical designs are a failsafe choice for most bedrooms, but they can really take a large bedroom to the next level of elegance and calm. Choose wall lights in a contrasting colour to the walls, and enjoy the striking, graphic effect. 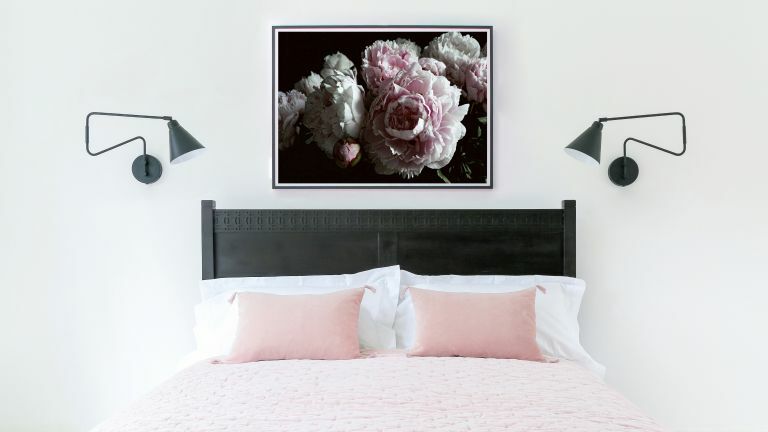 In this bedroom, Black Wall Lights have been paired up with The Hedonist Black Bed and pink bedlinen for a stunning, minimalist look. Both available from The French Bedroom Company. For a play, ultra-contemporary look, mix and match textured bedlinen, an industrial bedside unit, and an unusual bedside light. The key to keeping an eclectic look chic is staying within a neutral colour range if you're going for a variety of textures and shapes. Also, pick a light that can hold its own among other eclectic items. To create a similar scheme to this cool bedroom, find similar lamps and the Beadie Bedside cabinet at Out There Interiors. A contemporary task light is an effortless way to add a contemporary edge to any bedroom. Task lamps are functional, too, providing an easy plug-in alternative to wall mounted lights. We like the Obie Task Lamp in Brass from Made.com. Its shiny, metallic finish is right on trend, but it is still understated enough to fit most bedroom schemes. Want a Scandi bedroom with a minimum of effort? Invest in a great lamp or two, and even an otherwise generic bedroom will look interesting. For an authentic Scandinavian look, pick lighting that is geometric and sleek in design, steering well clear of anything ornate. Pick a Zuiver lamp to recreate this Scandi bedroom look by Cuckooland. Gold and brass decor accents are a great way to introduce a glamorous, vintage element into your bedroom design scheme. If a large, all-shiny lamp seems a bit much for your bedroom, choose something with just a touch of metallic sheen. We like the fun, Art Deco inspired Copper-effect Bell Jar Lamp from George Home. A well designed floor lamp can do wonders in a large, airy bedroom. Floor lamps are also an excellent choice if you prefer a minimalist bedroom lighting scheme – a big enough floor lamp may well meet all of your lighting needs. The Northern Gear Floor Lamp creates a striking, geometric contrast in this bedroom by Nest. Overhead lighting can be too harsh in a bedroom – but not if you choose a dainty, warm-toned pendant light. Just make sure that it isn't too low for your bedroom height. We like the wide range of pendant light styles available at John Lewis. Love the dark and atmospheric decorating trend? Complete the look with bedroom lighting to match. Our tip is to look for a glass light rather than a fabric lampshade, to achieve a dark effect without compromising on getting enough light for reading. The Mini Globe wall light in Anthracite by Original BTC is hand-blown and still perfectly practical as a bedside light.